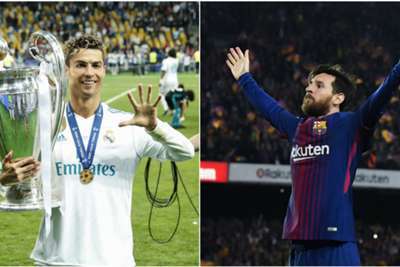 Lionel Messi and Cristiano Ronaldo will not play in next weekend's Clasico, the first time neither star has featured in the game since 2007. Ronaldo's move from Real Madrid to Juventus in a deal worth €112million meant October 28's clash would be the first Clasico without him in nine years. But Messi will also be absent from the clash after the Barcelona captain sustained a fractured arm in a 4-2 LaLiga win at home to Sevilla on Saturday. Messi set up Philippe Coutinho for Barca's opener in the second minute at Camp Nou before doubling the lead himself with a fine strike from 20 yards. But the Argentine attacker soon had to be replaced after damaging his right arm in a heavy fall, with Ousmane Dembele replacing him. Barca confirmed Messi will be out for around three weeks, ruling him out of Wednesday's meeting with Inter in the Champions League. And the Clasico will have an entirely new complexion after an era of Messi-Ronaldo dominance with neither player on show next weekend. Barca have not won a Clasico without Messi since his debut for the club, failing to win either of the two matches with Madrid he has missed since 2004.